"From project conception through brainstorming and iterations on design ideas and execution, we know we can count on Neudorfer to deliver a high-quality product on-time and on-budget. We get custom for a very competitive price, we get Bob's highly consultative and constructive approach, and we consistently get product that is highly-functional, beautiful, durable, and universally adored by our users and administration. When it needs to be just-so and just-right, we go with Neudorfer and are never disappointed." "I normally don't write letters to manufacturers and I believe this is a first for me in my career as a Director of Purchasing. I am writing to you today because I think your company manufactures beautiful, well made furniture that withstands time long beyond anyone's expectations. "In 1999, we purchased a dozen custom made tables for an alumni lounge in a new recreational facility so this year marks the 10th anniversary of the grand opening of the Alfond Center and the tables look as great as the day they were delivered. These tables are ganged together on a regular basis for large conference setups and they are also used as individual dining tables for formal events and meetings. When the 12 tables are ganged togther and locked in place, the grain of the wood lines up and matches perfectly giving the illusion of a very large and long conference table. On many occasions folks visiting the College have commented on how beautiful the oak tables are; the construction is simply elegant, solid and functional. "The Neudorfer tables are a great investment and I look forward to doing business with you again in the future." "We want to take this opportunity to thank you for the superb craftsmanship of our conference room table. You faithfully executed our design vision and added your own inspiration to the work. It has exceeded our expectations functionally and esthetically. "Once again, thank you for your work and we look forward to our next project together." "Wow, the lab tables are absolutely beautiful! They are so attractive and very functional and they pull the new room together nicely as a working laboratory. I know you will be pleased when you see them! "And, I want to tell you again how much everyone likes the modular seminar table! Every time I look into that room, the table is configured differently, serving the diverse teaching styles of the faculty who teach there. "Both the students and faculty are so pleased with the renovations at Kirner-Johnson! The classrooms are more functional and the space better utilized. And now, there is a Neudorfer table in almost every public room! "Thank you for providing such a wonderful product, with such beautiful workmanship. We are lucky to have you in the Hamilton family." "I want to tell you how pleased I am with the tables that you provided for the new private dining rooms at Colby. Our president wanted something special for these rooms, and the furniture you provided has exceeded our expectations. "It was a pleasure to work with you in designing tables that perfectly fit our needs for size and style. The tables you designed are elegant as well as being functional. I was somewhat apprehensive about using the Veneer-Art® top, which you recommended for its greater durability. In fact, we have been delighted with the finished appearance, and I expect that few people realize they are not eating off a solid wood top. "I especially appreciate the lengths you went to to ensure that we had the tables in time for our dedication, despite problems with material deliveries on your own end. And you remained congenial and cooperative through the entire process. "Your tables are beautiful, and I don't think anyone here regrets spending the money to get the right table for the situation we faced. I hope that we will have many other opportunities to do business with you in the future." "I am pleased to be a part of what I am sure are a great number of Neudorfer, Inc. satisfied customers. "We have utilized your quality tables in a number of commercial and educational facilities. The tables we have utilized range from the fairly simple Parsons series to elaborate custom Bank Board of Director tables for up to 30 chairs. "We have been extremely pleased with the products from both a quality, price perspective, and consider them an excellent purchase." "Rochester Institute of Technology is in the midst of a $50 million residence hall renovation. We have been pleased to be using Neudorfer tables in our study lounges as well as end tables in our TV lounges. "The Neudorfer line is versatile. We have been pleased with the quality of the tables when they arrive. Robert Neudorfer, President, has been very available for consultation or questions throughout the project. 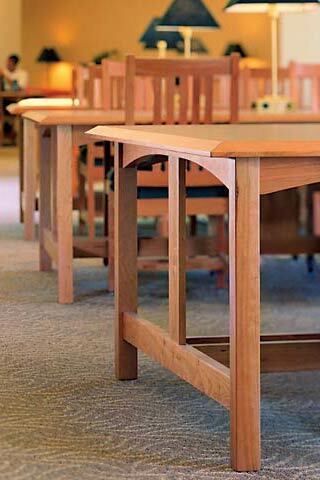 We would recommend Neudorfer tables in your residence halls." "Many thanks for your assistance in ensuring another successful project here. The use of the Veneer-Art ® surface on our tables within the Kenyon Arena support spaces continues to invoke many inquiries from our guests. We owe you a debt of gratitude for introducing us to this fine product. "Over the past ten years we have specified Veneer-Art® on dining room, classroom, and occasional tables and have not needed to repair or replace any surfaces. The product does not appear artificial and the alcohol, water, and scratch resistant properties are wonderful. "We look forward to continued success with your firm." "We are purchasing [your] furniture for our hotel, The Hampton Inn & Suites - Annapolis, MD, and will be continuing to purchase your furniture for our future projects. "As I mentioned to you yesterday, High Hotels, Ltd. thinks the world of your products! Our hotels are not complete without Neudorfer furniture!!! Kudos to the folks who build your products!!" "I want to thank you for your remarkable effort on the Governor Dummer Academy furniture. The tables are a great success and are indeed providing the flexible classroom layouts which were desired. "I am truly grateful, personally and professionally, for your expertise and commitment, which was critical to the project's success." "The timing on these smaller fast track projects is just as important to us as the largest project, but at times can be the most difficult to pull together in the time frame allotted. "I want you to know how much I appreciate your extra effort and attention in fabricating the conference tables for the Norton Company. They arrived on time and look great in the space. It has been a pleasure to work with you." "Thanks for being a lifesaver! You went out of your way to assure that your product made it to our client in time. I really appreciate the extra effort." "Many thanks in shipping the Series 300-V table prior to the acknowledgment, estimated ship date. Our client is very happy with the matching finish and with the service." "I am very pleased with the tables you produced for our project at the Dewey Hall Dining facility. The craftsmanship is excellent and beautiful which helped complete the look we wanted to achieve in the interior of the dining hall. "Thank you for all your efforts meeting the budget, deadlines, and providing a high quality product. "It was a pleasure working with you, and I look forward to future projects with Neudorfer Tables!"